We have the perfect solution for you ! COF presents you the auto tracking cloud camera which will keep your house safe and helps you track your belongings . This is a 1080p FULL HIGH-DEFINITION, 360° HORIZONTAL & 260° VERTICAL VIEW, with 118° wide-angle advanced glass lens create a complete 360° coverage without blind zone. Advanced night vision with built-in 940nm infrared LED beads extend the viewing distance to 8 feet in pitch dark with no light pollution. 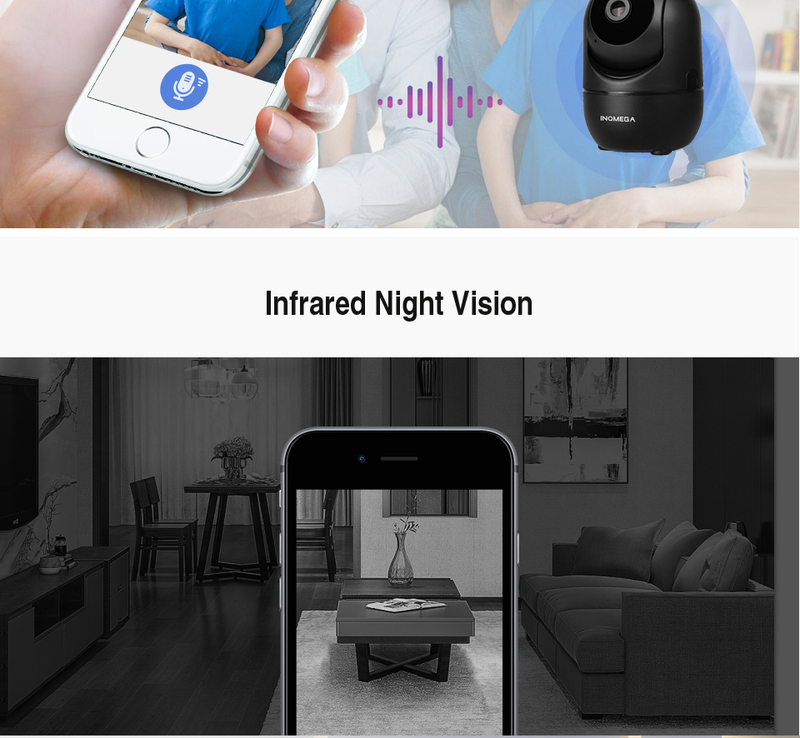 This wifi camera is simply brilliant enough to detect each moment instantly as soon as somebody moves along and therefore best when yours baby is alone in the room or there is a theft attempt ! This device can move 360 degree and can completely capture each object moving . At the same time , you can communicate 2 ways when you are out with somebody at home . This is coool !!!! This smart device can be connected with mobiles of any OS . Please follow the connecting process at the end of this page . For Android phone users, download the free app by searching "YCC365" in "Google Play Store" or scanning the QR-Code on the camera package. Add the camera device (You can choose four ways to add your camera. Please make sure the WIFI Password is correct. (Our Camera Only Support 2.4Ghz Wifi . Please make sure the router signal is stable (place IP Camera close to your router for first connection is Recommended).The Camera will not work on a 5Ghz wireless standard at this time. If you have a dual-band router, be sure to segregate your wireless channels and connect the Camera to the 2.4ghz channel. Please check that your wifi name and password do not have special symbols, our camera can only recognize English letters and numbers..
- Reset is used to boost the IP Camera system, which become more efficient to accept the unknown router and connect it. - Reset will erase all user settings including WIFI information, access password, alarm information, arming zones information. - Find the reset hole at the bottom of the device, and then use needle to insert it, press it more more than three seconds after hearing "di" sound, when hearing 'Reset to be defaulted setting' sound, then camera reset successfully. Yes. Support SD Card and cloud storage recordings at the same time if you put SD Card and purchase cloud storage service.